Mountains, mountains everywhere! We're in Andorra! Hello and welcome CT fans to the Tour d'Andorra! If you like gruesome mountain stages, then you've zapped across to the right channel. 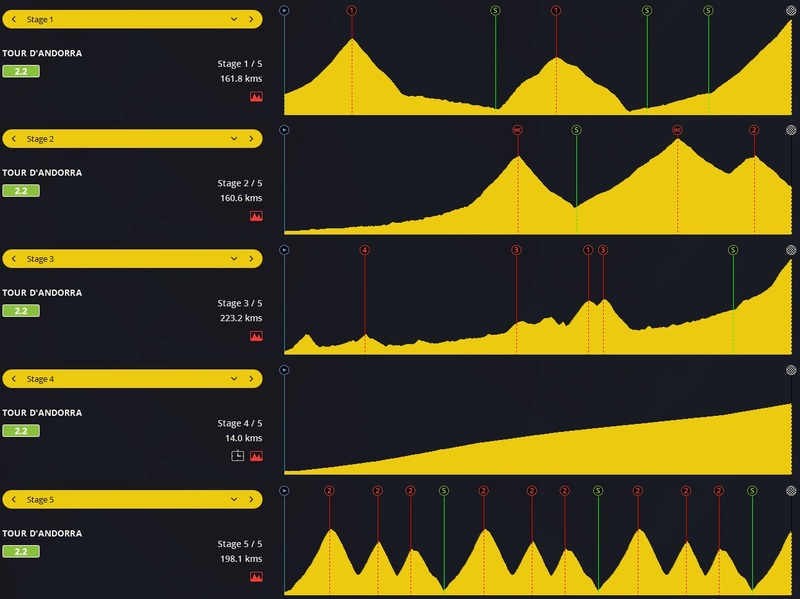 The five stages of this race pretty much feature every type of mountain stage available on the menu. We start off with a 160-kilometre stage with three long mountains, though the stage is relatively short. Then we get to a downhill finish stage, followed by a stage in which the favourites will face no difficulties until the final climb. Afterwards, we get a 14-kilometre mountain TT in which the strongest climbers will certainly enter the spotlight. And if that wasn't enough, the race finishes off with a marathon 10-climb stage around Andorra! Last year's winner Rafael Valls has decided to join the PCT this year and therefore is unable to claim his title, as well as last year's second place, Pierre Paolo Penasa. Bronze medal winner Anacona is here though, now riding for Banco de Bogota. Needless to say, you need to be able to climb the mountains if you want to have any shot at winning this race. The second most important stat is usually acceleration, though with the very long climbs, it may not be as decisive as usual. Therefore, an argument can be made that either stamina, resistance or time trial abilities may be crucial, too. The C2HC status means that all CT teams are involved in this race, which means all top climbers of the CT have joined too. Four of them allow to the “80 club”, having a mountain rating of 80. And obviously, they are the race favourites! Let's intruduce them first, shall we? When we sort on acceleration, Jaime Suaza comes first. The Colombian has had a decent season so far, in which he showed that his superb acceleration has been more than enough to cover up his famous weaknesses so far. Though his poor stamina might mean he can struggle in stages 2 and 5, mainly. His rivals will make sure to try to tire him out there, if he performs as well as expected. Second is Thibaut Pinot. With great resistance stats and an acceptable acceleration, he should be able to shine on every of this race's mountain stages. A clear weakness is his TT skill though, which he has to compensate by.. Well, just climbing as fast as possible in the TT! As probably the most well-balanced of the four, Robert Kiserlovski will be looking to beat his rivals with more consistent results. Though he will have to watch out for attacks by the aforementioned two, as his acceleration is a bit weaker. If Kiserlovski takes the crown here, he'll likely do it by being a diesel and slowly crawling his way back up front after other rider's attacks early on in the mountains. And fourth but.. Well, least... It's Vladim Ratiy for Oberfranken. Though he is able to climb the mountains just as well as the other three names, his extremely weak acceleration makes it hard to think he won't lose time on one or two more fast-paced stages. Though with his hill stat being a non-issue in this race, he'll certainly be a rider to watch for, too. A huge amount of riders then are looking for an upset. König is probably the most well-balanced of the four main (“79”) outsiders, though Pomishnikov (stamina, resistance) has the material to surprise as well. Anacona will be looking to improve on last year's third place, but still has his poor acceleration haunting him. Lastly, Costagli is a great climber on paper, but has nothing interesting when it comes to substats. Therefore, he'll likely have the most trouble getting into the top 5. Some outsiders to look out for are Panayotov, who is having a good season so far, Atapuma, who may have to work for Suaza but can perform by himself too, and Diaz, who may have an edge over his opponents in the TT. 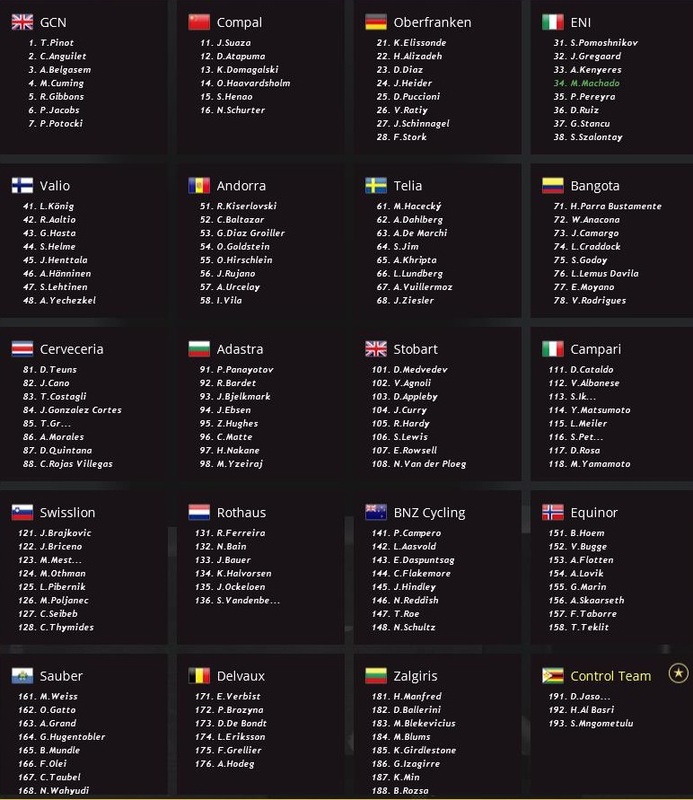 Even further down, Hacecký and Bardet also deserve a mention due to their high acceleration, and might sneak into the top 10 if they use that stat well. Join us in 24 hours for what should be a spectacular race! Suaza ftw, but I expect some GC changes on almost every day here. Hoping for Pinot to shine here. While Suaza seems to be the best pure climber in the CT division (even though not winning today), it was always between Pinot and Kiserlovski for the best stage racer. As they rode totally different schedules for the first couple months, Kiserlovski now has shown for another time, that he seems to be the very best of the CT beating Pinot yet again. Panayotov though with a huge day! Congrats. Hopefully König will once again be able to rise and do something noteworthy - generally does better further in to the races. Seriously though, if we can just get to the end of the race without the riders all dropping out or without them complaining at us for forcing them to ride here we will be happy. Good start, gaining some time on Pinot and Konig. BNZ! Wow what a performance from Campero, two days in a row for the 78s! Suaza already in the driving seat though. So far, this is proving to be the most successfull stage race in Compal's history. I'm a little worried about the time trial, but so far, so good!